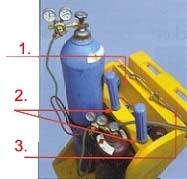 Provides safe and convenient handling of acetylene and oxygen cylinders. Polyethylene construction protects cylinders from scratches and chipped paint - significantly reduces refurbishing needs, improves cosmetics. Numerous "built-in" features keep welding accessories close at hand for quick access. Rugged design optimizes the center of balance, assures safe handling and greater mobility. 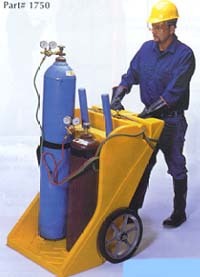 Large tool tray holds goggles, gloves and other welding tools. 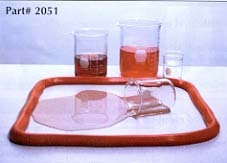 Two (2) molded openings hold optional, removable rod guards. Host storage area keeps hoses safe, organized and out of the way.